Have you ever been on holiday (perhaps to somewhere remote or far away) and felt like you didn’t belong there? Felt that maybe this place was too alien for you to cope with? That you didn’t really know as much about the place as you thought you did? Well then White Settlers (directed by Simeon Halligan, who previously helmed Splintered)might be the film for you! That terrifying uncertainty, that fear of the unknown, is what is at the centre of this film from Grimm entertainment (who are also responsible for the popular Manchester horror film festival Grimmfest). Set in the beautiful countryside of Scotland, it follows a young couple from London, Ed and Sarah, as they prepare to start their new life in their new home; an isolated farmhouse right in the middle of nowhere. As darkness falls, Sarah begins to suspect that they are not alone and a horrifying nightmare begins. It becomes all too clear to the couple that they are most definitely welcome in their new home. The thing that stands out the most about White Settlers is Pollyanna Mc Intosh’s captivating performance as Sarah. Probably best known for playing the starring role in 2011’s The Woman, Pollyanna is no stranger to playing strong female roles and this one is no exception. Sarah is tough, resourceful and headstrong, but she is also played with a genuine feeling fragility that makes her more human and multi-dimensional. In fact, she is the protagonist of the film, whilst Lee Williams plays the supporting role as Ed. The chemistry between the two is very believable, which helps us invest more willingly into their plight. The frayed edges of their seemingly happy and idyllic relationship are revealed just before the two meet their real nemeses, so when they do appear, it’s almost as if they are the breakdown of Ed and Sarah’s relationship personified. As you might have guessed by now, this is a home invasion film. We’ve seen quite a lot of those recently, most memorably You’re Next and while this film does share similarities with that film and others, such as (the underrated in my opinion) The Strangers, it shares more in common with Sam Peckinpah’s Straw Dogs. Both are about a screen couple having their home invaded by angry locals and share the same palpable sense of fear and themes of racism and the darker side of nationalism. Unfortunately, the film does suffers from the feeling that you have seen this kind of thing before and that we’re just going through the motions; probably for the reasons mentioned above. That isn’t to say that it’s unoriginal though and the twist at the end is a stroke of genius, making the entirety of the events we have witnessed seem very real… like something you would read about in the morning newspapers. 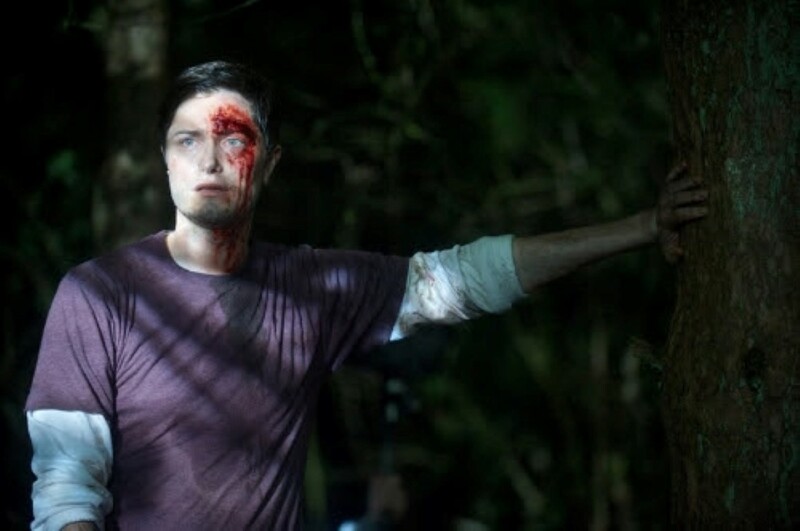 WHITE SETTLERS is directed by Simeon Halligan and stars Pollyanna McIntosh, Lee Williams and Joanne Mitchell. It is now available on VOD, and in limited UK theaters. It is also available on DVD.